Young, 33, makes money from companies that pay her to endorse their products on her Instagram feed, and she’s part of a burgeoning ecosystem of social media influencers—made possible by the billions of users eager for their content, and advertisers hungry for new ways to a youthful audience. She is the subject of the latest episode of Bloomberg’s mini-documentary series, Next Jobs, which features people in careers that didn’t exist a generation ago. Companies may end up spending US$1.6 billion this year on this kind of marketing on Facebook Inc.’s Instagram alone, and as much as US$6.3 billion when including other platforms like YouTube and Twitch, according to estimates from Mediakix, a marketing agency. That money has fueled the rise of influencers around the world, flooding Instagram with millions of #sponsored and #ad posts a year. But the majority of people declaring their sponsorships are unlikely to be earning enough to be making a living from it, Mediakix Chief Executive Officer Evan Asano says. Young is an exception: She’s on track to earn between US$50,000 and US$100,000 over the next year as a full-time influencer, from sponsorships as well as photo licensing fees. It’s not the income of a megastar, but it’s enough for her to pay her bills. Young promotes a variety of products and destinations related to mountaineering (see the sponsored post above for one example). The process starts with landing sponsorship deals. Companies do reach out with unsolicited offers, Young says, but she turns down the majority of those. 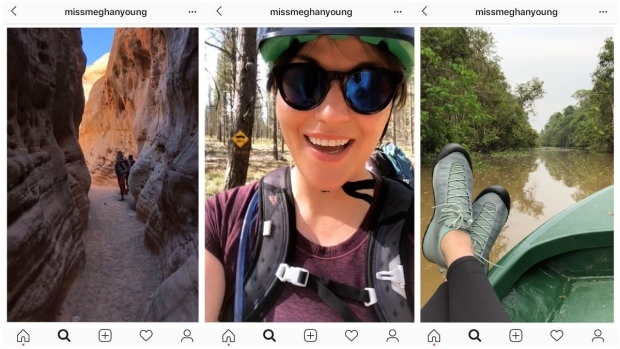 Many such offers have nothing to do with the outdoor adventures she posts about—hiking boots would be relevant but makeup would not—and others are from companies that are direct competitors with her biggest sponsors, with whom she has relationships she doesn’t want to risk. That means she spends days or even weeks researching potential clients’ planned marketing campaigns and then tailoring the proposals she sends out to match their needs. She estimates that about 70 per cent of the pitches she sends to potential partners end in rejection. But her legal skills haven’t gone to waste. Once companies express an interest in working with her, there’s the tricky task of negotiating the terms of the deal. She goes through each line of the contract, crossing out certain specifications. When it comes to the money, most companies start with a lowball offer, kicking off a process that can stretch out for weeks. Her floor is generally US$1,500 per post to her lasting feed, or US$200 per day for stories that disappear after 24 hours. And the work is still unfinished even after she’s done taking the photos. When Young returns from her adventures, she carefully edits the images and drafts captions to go along with them. Then, once the posts are public, businesses sometimes don’t pay on time. That’s when she needs to follow up and send new invoices with a late fee tacked on. Her least favorite hurdle is when she discovers that a company used her photos in a way that violates the terms of the contract, leading to tense and time-consuming email exchanges. The biggest stars on social platforms outsource this kind of work to an agency. In a telltale sign of a fast-growing field, there’s now a cottage industry of support services directed specifically at influencers. But agencies take a cut of influencers’ earnings—often ranging from 20 to 30 per cent for bigger stars, and 30 to 50 per cent for smaller ones—making it financially tenable for only those with a significant enough following. With 185,000 followers, Young is probably right at the cusp of needing representation. She has long been weary of the fees associated with an agency, but with more business coming in, the administrative tasks are piling up. Even with an agency’s help, social media influencing is still a full-time job, thanks to the platforms’ bottomless appetite for content. The stress it creates even has its own name: creator burnout. Young has learned to set certain boundaries: She used to obsessively check her posts’ performance, which she says will “drive you insane,” so she stopped. And she’ll put her phone away if her partner glares at her from across the dinner table as she types out a reply to her latest commenter. But if she doesn’t reply, people will stop commenting, and without that engagement on her feed, brands won’t want to keep paying her. So she’s resigned to the fact that she’ll be tethered to her phone as long as she’s in this line of work. Beyond the day-to-day headaches of a career online, social media’s inherent uncertainty also poses more existential problems for creators. Sponsorships come in spurts, and there are times when Young is staring at the calendar without another project in the works. Plus, the rules of the game change often. Recently, she noticed that the engagement on her posts is lower, which she attributes to a change in Instagram’s algorithms. In the long-term, it can be risky to hinge a career on a single platform, or even on social media itself. But for aspiring influencers undeterred by the fickleness of online fame, Young may be a good model. Unlike many of the biggest stars on social media, she wasn’t already famous from, say, professional sports or reality television: She was a law student fleeing the stresses and drudgery of school, driving to the mountains every weekend and posting about her hikes. After graduating, she grew her account and influencer earnings steadily, not through lucky breaks. And she did it while working a day job as a sales and business development manager at a restaurant group. In March, she was finally able to quit and focus on her influencer career full time.